It's not hard to understand why The Lion King's good-vs.-evil adventure and high-spirited comic passages haven't lost their appeal. 87 min. Walt Disney Studios Distribution. Directors: Roger Allers, Rob Minkoff. Cast: Jonathan Taylor-Thomas, Matthew Broderick, James Earl Jones, Jeremy Irons, Moira Kelly. The Lion King shocked the movie industry by becoming a hit all over again in 2011 in its 3D theatrical re-release, just weeks before its hi-def home video debut (in 2D and 3D editions). Add this to the smash hit, Tony Award-winning Broadway musical adaptation, and it's impossibly to deny the film's widespread cultural impact. The story may not be as personally accessible for kids as some others in the Disney canon, but it's not hard to understand why The Lion King's good-vs.-evil adventure and high-spirited comic passages haven't lost their appeal. Atop Africa's Pride Rock, lion king Mufasa (James Earl Jones) proudly presents newborn cub Simba (voice of Jonathan Taylor Thomas; young-Michael Jackson-esque singing voice of Jason Weaver) to the animals of the Pride Lands, including avian royal adviser Zasu (Rowan Atkinson). Ever in the shadows, Mufasa's jealous brother Scar (a drawling Jeremy Irons, droll and scary) plots to make the kingship his own, enlisting hyena henchmen (Whoopi Goldberg, Cheech Marin, and Jim Cummings) to help him carry out opportunistic murder. Scar's actions send Simba into exile, where he encounters meerkat Timon (Nathan Lane) and warthog Pumbaa (Ernie Sabella). 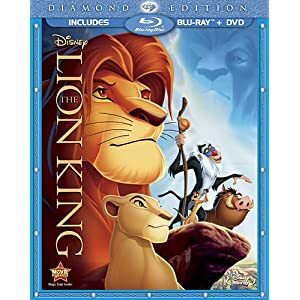 As his lioness crush Nala (Moira Kelly) matures, so too Simba grows into lionhood (Matthew Broderick; Joseph Williams); with the help of crafty old monkey Rafiki (Robert Guillaume), Simba resolves to return home to liberate his mother Queen Sarabi (Madge Sinclair) and reclaim his rightful place on the throne. Don't buy the common line that The Lion King evokes Hamlet; the screenplay credited to Irene Mecchi, Jonathan Roberts and Linda Woolverton hews more closely to Biblical epic than the Bard (and perhaps most closely to anime Kimba the White Lion, but that's a controversy for another day). At 87 minutes, the picture works in spite of its herky-jerky narrative, which could stand a bit of fleshing out in the third act. The terrific voice cast goes a long way, with the comic support of Lane, Sabella and Atkinson proving positively invaluable, and the colorful animation consistently impresses, whether in creative abstraction ("I Just Can't Wait to Be King") or naturalistic nature-film action (the centerpiece wildebeest stampede). 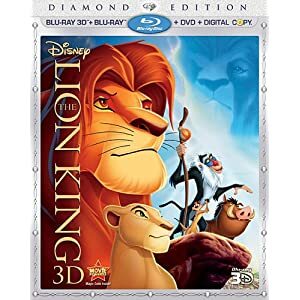 Disney goes whole (wart)hog for The Lion King with its Diamond Edition hi-def premiere, available in a Blu-ray 3D + Blu-ray + DVD + Digital Copy combo pack (also available in Blu-ray + DVD combo pack). The 3D presentation is well worth the bump in price, for 3D TV owners. Nearly as impressive as Beauty and the Beast in 3D, The Lion King doesn't seem like the post-conversion it is: this was always a film designed with planes of depth (something of a Disney animation tradition), and 3D just allows more dynamic separation of those planes. Certainly the wildebeest stampede puts the film's best 3D paw forward, but the format also adds pizazz to the musical numbers and the depiction of the natural settings throughout (as for the potential pitfall of crosstalk, it is present, but only fleetingly). All this above and beyond the excellence of the 2D transfer, also included here. Colors are brilliant, black level bottomless, and detail outstanding. Put simply, this is a gorgeous transfer, with a 3D punchup that makes a valid alternate version of the film. As for the audio, in DTS-HD Master Audio 7.1 surround, The Lion King's music has never sounded fuller, and the effects have never been more thunderous for home theaters. Precision separation and a dynamic range that's jaw-dropping make this a powerful (and, at times, even subtle) listening experience. The extensive bonus features start with the now requisite Disney Second Screen feature, which allows one to sync up playback of the movie to one's iPad or computer to access fun facts, design galleries, behind-the-scenes video clips, the original September 1992 story outline, and various kid-friendly games and activities. Meanwhile, Sing-Along Mode amounts to subtitles for the musical numbers. Also included is the vintage audio commentary by producer Don Hahn and directors Roger Allers and Rob Minkoff. It's a terrific historical document with lots of behind-the-scenes secrets about the film's development and production, and the many changes made along the way. "Bloopers & Outtakes" (3:44, HD), Pixar-style, animates some flubs. The Backstage Disney: Diamond Edition section kicks off with "Pride of The Lion King" (38:06, HD) a brand-new retrospective gathering Hahn, Allers, Minkoff, Peter Schneider, Thomas Schumacher, Michael Eisner, Jeffrey Katzenberg, Hans Zimmer, Tim Rice, Matthew Broderick, Nathan Lane, Julie Taymor, and much of the film's animation staff. The doc also incorporates some nifty archival footage. "The Lion King: A Memoir - Don Hahn" (19:30, HD) pairs Hahn's comments with archival footage and design art to tell the story of how the film came to be. Four newly available "Deleted & Alternate Scenes" (14:33, HD) come with intros by Allers and Minkoff. Unfortunately, the deleted and abandoned scenes previously available on DVD don't return here. Music & More includes the "The Morning Report" (2:30, HD), an added scene prepared for the film's IMAX re-release and previously made available on DVD. An Interactive Art Gallery comprises Character Design (165 images), Visual Development (115 images), Storyboards (84 images), and Layouts and Backgrounds (50 images). Via BD-Live, Disney's Virtual Vault gives access to archival DVD bonus features. These include "The Making of 'The Morning Report'" (3:09), three additional deleted scenes with Don Hahn intros (0:50, 2:24, 1:44), a "Circle of Life" storyboard-to-film split-screen comparison (3:59), two early concept reels (2:56, 3:59), the "Warthog Rhapsody" demo with Hahn intro (4:17); and music featurettes "Musical Inspiration" (3:49), "Landmark Songwriting" (3:13), "Orchestral Color" (4:23), "Scoring Emotion" (2:58), "Music: African Influence" (3:48), "Full Circle" (1:43), and Elton John's "Circle of Life" music video (4:57); Broadway featurettes "Musical Origins" (4:00), "Screen to Stage" (3:41), "Musical Texture" (3:26), "Setting the Stage" (2:29), and "Leaps of Fantasy" (3:46); film featurettes "Origins" (5:54), "Production Research Trip" (2:21), "Art: African Influences" (4:02), "Reflections" (5:10), "Storyboard Process" (1:55); "Character Design" videos for "Mufasa" (0:51), "Simba" (1:53), "Scar" (2:39), "Rafiki" (1:09), "Timon & Pumbaa" (1:51), "Zazu" (1:15), and "Hyenas" (1:21); and "Computer Animation" (4:26); and story featurettes "Story Origins" (4:36), "Timeless Themes" (3:57), and "The Story Comes to Life" (3:13). I'd much rather see such standard def extras fit onto the DVD disc here—I mean, really, why not, other than driving fans to the Disney site? And not having to pay as much to the talent involved? (wait, I think I answered my own question)—but this is an impressive release all the same. All site content © 2000-2019 Peter Canavese. Page generated at 04/18/2019 06:32:49AM.